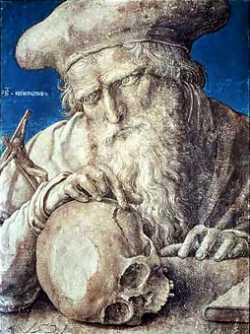 Saint Jerome and a skull (purportedly a late-paying client), by Lucas van Leyden. St Jerome: a man as relevant to translators today as he was in 420AD! International Translation Day has been promoted since 1991 by the FIT. The day coincides with St Jerome’s Day, who was recognised by the Catholic Church as the patron saint of translators, scholars and editors, as well as libraries and librarians. Check out this post for a full run-down on the man who was “no admirer of moderation, whether in virtue or against evil”. Jill Sommer has a great post on St Jerome here. Corinne McKay encourages us to thank a terminologist here. Aquí un artículo sobre San Jerónimo para mis amigos hispanohablantes. Julia James discusses some interesting challenges facing the field of translation here. Finally, English PEN have released an anthology with extracts from some of the best international writers of our time in translation, so get your free download here. Celebrate in style, colleagues and friends. I know I will. Happy Translation Day to all. I think that a worse protector could not be found. He was the worst translator of the Bible even existed.